What creature is just as at home in the Hoh Rainforest as it is on the surface of Mars? As happy soaring through the solar system as it is splashing in a salmon stream? As comfortable reclining against a tree trunk as it is riding on the back of a dinosaur? An elf, that’s what. Specifically, the numerous elves who call the Denver Museum of Nature & Science home. Throughout the museum, you’ll find elves hidden on every floor and in nearly every gallery. Most are painted into the backdrops of dioramas, their pointed caps and beards blending into the scenery, though there are also a few elf figurines and even a couple of elves concealed within the ever-looping informational videos. So, how did a museum dedicated to all things scientific find itself host to a squad of tiny, mythological men? The earliest elves moved in during the 1970s, when artist Kent Pendleton began painting backdrops for many of the museum’s wildlife dioramas. 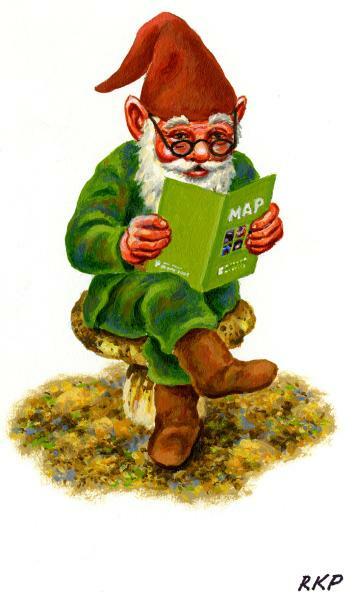 But the artist didn’t always stick to leaves and woodland critters; he sometimes included a miniscule little man — he initially called them leprechauns, but DMNS refers to them as elves, and many people agree that they resemble garden gnomes — peeking out from behind a tree or perched on a rock. Staffers and visitors were so charmed by Pendleton’s creations that the museum decided to create a scavenger hunt around the concept. Sort of an elven Where’s Waldo? Visitors can stop by the information desk in the main lobby to pick up a "Find the Hidden Elves Scavenger Hunt" sheet (also available online and in both English and Spanish), which will lead you to specific locations throughout the museum and help you find the elves’ secret hiding spots within each exhibit. The descriptions are pretty specific, but it’s still a challenge, since each painted elf is only a few inches tall and often well-camouflaged. Although it’s a great activity for families with small children, elf-spotting is also popular with adult visitors — and staffers. As interest in the elves grew, the museum added more. Today, in addition to Pendleton’s paintings, you’ll also find three-dimensional elves lurking near escalators and in dioramas and digital elves gliding across video screens. And though there are only nine elves listed on the scavenger hunt sheet, O’Neal says there are about double that number in total, so keep your eyes peeled! Love playing detective? Denver Museum of Nature & Science also offers museum treasures, national parks and state symbols scavenger hunts.